Laurencin, a CASE member since 2009, is a pioneer who has developed technologies that are revolutionary and that are in use in important applications in the marketplace. He has exhibited leadership and courage in the development of new initiatives for science and entrepreneurship. Laurencin is a University Professor at UConn. He is the 8th University Professor in the school’s history. This rare title is awarded to individuals for extraordinary academic excellence, and sustained, high-level achievements in administration at the school and is UConn’s highest faculty distinction. He currently is chief executive officer of the Connecticut Institute for Clinical and Translational Science, where he leads the university’s translational science research infrastructure. He is the founding director of the Institute for Regenerative Engineering and the Raymond and Beverly Sackler Center for Biomedical, Biological, Physical, and Engineering Sciences at UConn Health. In addition, he is a professor across the university, as well as a board certified orthopaedic surgeon, endowed professor of orthopaedic surgery, and fellow of the American Academy of Orthopaedic Surgeons, the American Institute of Chemical Engineers, the Biomedical Engineering Society, the Materials Research Society, and the American Chemical Society. Laurencin has achieved not only a breadth of experience across multiple fields, but also a depth of accomplishments that places him at the highest echelon of each area in which he has been involved. He is the scientific founder of Soft Tissue Regeneration (STR), a Connecticut company. STR is commercializing breakthrough technologies for anterior cruciate ligament regeneration (knee) and rotator cuff regeneration (shoulder). The shoulder rotator cuff regeneration device has been cleared for use by the FDA, and the anterior cruciate ligament device is now in clinical trials in Europe. In addition to STR, Laurencin is scientific co-founder of Natural Polymer Devices (NPD). NPD is a Connecticut company that focuses on developing polysaccharide polymer technologies for bone regeneration. The company is in the process of seeking FDA clearance of a novel fracture repair device for the treatment of cervical spine fractures. 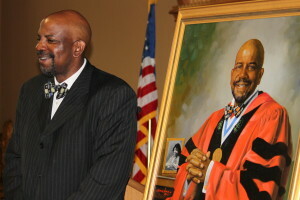 Laurencin was named one of the 100 Engineers of the Modern Era by the American Institute of Chemical Engineers at their Centennial Celebration in 2009. He was named for his seminal work in the development of polymerceramic systems for bone repair. In seminal papers and patents, he described the development of composite matrix systems that could foster bone healing. That research, which has continued to this day, has been the inspiration for the biocomposite interference screw, a principal means of fixation bone. Laurencin’s work in the development of sintered polymer microspheres for bone repair has inspired products now on the market. His research has also focused on the development of degradable polymers for drug delivery applications based on the polyanhydrides. Work in that area resulted in the development of products for bone infection treatment and brain tumor treatment. Laurencin has shown leadership nationally and in Connecticut in the fostering of new technology. He served as a permanent member of the orthopaedic device panel for the U.S. Food and Drug Administration. Later he was appointed by the Secretary of Health and Human Services to the National Science Advisory Board (Science Board) of the FDA, the overseeing body of that agency. There he helped revamp the FDA and its mission of providing scientifically based decisions on the approval of devices, drugs, and biologics. In Connecticut, Laurencin has performed distinguished service of the highest order. He was the faculty leader in the development of the state’s Bioscience Connecticut Initiative. This initiative calls for doubling incubator space for new companies at UConn, while otherwise fostering a collaborative environment that encourages inventorship and innovation. Much of the success in the passage of Bioscience Connecticut, especially in educating individuals on the benefits of the initiative, has been attributed to Laurencin. Laurencin is recognized regionally, nationally and internationally for his work in developing new technologies. In Connecticut, Laurencin was named the 2014 CURE Connecticut Academic Entrepreneur of the Year. He received the Technology Innovation and Development Award from the Society for Biomaterials, their highest award for inventorship, and in 2013 was inducted into the National Academy of Inventors. Laurencin is an elected member of both the National Academy of Medicine and the National Academy of Engineering, the first orthopaedic surgeon in history to achieve dual election. Internationally, he is a fellow of the Indian National Academy of Sciences, a foreign fellow of the Chinese Academy of Engineering, an associate fellow of the African Academy of Sciences, and a fellow of The World Academy of Sciences. He was named a recipient of the National Medal of Technology & Innovation in December 2015.